Feast or Famine might accurately describe fishing in Alaska. Generally speaking... if it's fishing season, it's good, but Alaskan anglers realize the season is short. Too short. Fast and Furious is also fitting terminology describing the frenzy most Alaskans know as summer. Because of this, we fish hard, sometimes through the night neglecting family and employment obligations with a distorted perspective of where things belong on our priority list. Then we'll push the limits of the season until the last possible moment, hoping to get some late Silver action or hammer a few more glutinous Rainbows, but eventually the rod guides will freeze, and the ice flows on the Anchor bring our fishing season to a close for yet another long winter. During this blur of endless daylight we call fishing season, our gear gets battered, beaten, and hammered fighting oversized fish, and may at season's end be wrongfully retired for the year, without the necessary maintenance that all working things require. NOW, as spring is fast approaching and the Y2K kings are nearing the Alaska coast, we should dig out all the equipment that we'll rely on to serve us in yet another frenzied summer season and perform some routine inspections and repairs. Waders should be cleaned and examined for external damage and potential leaks. Nothing can dampen an already cold, wet trip faster than to step into the water, only to find a significant leak. Upon examination, some areas of damage will be obvious, but others may remain visually obscure requiring other methods of checking for leaks. One method that works quite well is to take a bright shop light (with some form of wire grill, or protection over the bulb) into a dark room, or closet then insert the light into the waders. Close the top of the waders to prevent light from escaping, then move the light around, up and down both legs and feet. If a pinhole is present the light will often penetrate through that spot making the location of damage apparent. Areas with obvious abrasions or partial punctures, as well as the crotch and seams should be carefully checked and a marking pen kept handy to note the location. If you remember having a leak in a particular area of the waders, but don't locate it with the light test, a submersion test may reveal it. The area in question can be partially submerged in a tub, sink or bucket by pressing the outside of the wader down into the water to create external pressure, while keeping the interior of the wader dry. A slow leak will reveal itself over time as a small bead of water forming on the inside of the wader. The reverse of this would be to fill that portion of the wader with water and look for beads forming on the outside. Patch kits can be purchased for repairing breathable microfibers, neoprene, and rubber, but the different products require patching made specifically for those waders. NOTE: Waders should always be hung until thoroughly dry, and rubber waders in particular should be stored in this position to prevent permanent folds and cracks which result in leakage. When storing for long periods (winter), spraying the outside of rubber waders with a silicone spray will seal the rubber from ozone deterioration and oxidation and extend their life by several years. Boots are much less prone to problems than the waders, but should still be examined for damage, or areas that need attention. Felt soles are a soft material, which gives them desirable traction properties on slick surface but that also makes them prone to wear. Occasionally, even with light wear, the felt can delaminate from the boot bottom, and will need to be repaired or replaced. Felt Sole replacement kits are sold for that purpose. Boot laces should also be examined for excessive wear and shredding of the material. Laces are inexpensive to replace, but can be difficult to find on remote Alaska streams in mid season. For the most part, rods either work or they don't, although they too should be examined and cleaned. The reel seat in particular has a tendency to collect mud or grit as a part of everyday use, and can make the lock down rings difficult to use. A mild dish detergent, and old tooth brush works great for cleaning the threads and guides. While wiping down the entire rod, examine the guides for damage, but also carefully examine the rod surface for evidence of damage. Flyfishing in Alaska poses a somewhat unique situation that results in broken rods. Because salmon are large fish, and often hold in the deepest water, we're required to use oversized flies, laden with lead. Large dumbbell eyes and split shot can occasionally strike the rod during casting or when the line shoots back at the angler when a fish is lost near the shore. When lead strikes the rod, microscopic fractures can occur which may appear as a nick or ding in the rod surface. The rod may seem to perform as usual, but is prone to failure (broken rod) at some future time when it's stressed by a large fish. If nicks or potential fracture sites are identified, have the rod examined by a professional for possible warranty replacement. NOTE: Rods stored in a hard case WITHOUT a fabric sleeve will rattle around and cause wear surface areas where it comes in contact with the case. These spots appear to be dull patches that can eventually weaken the rod and cause a failure. Most reels today are remarkably reliable and maintenance free but do require cleaning for optimal performance. Examine the reel for damage and ease of operation. A tooth brush, mild soap solution, and a warm water rinse should easily remove last year's accumulation of old lubricant and grime. Greases and lubricants have a tendency to collect grit, so a light film where necessary, should be all that's required to keep things running smoothly. If many large fish have been played with heavy drag settings, wear can occur to the drag surfaces which may require an adjustment of the mechanism. 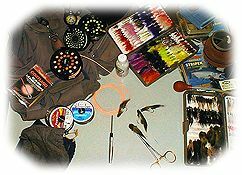 Some user manuals describe and illustrate drag adjustments, but the procedure may need to be performed by a local fly shop. Before storing the reel it should be allowed to dry thoroughly, and the drag should be completely backed off to prevent compression and hardening of the drag surfaces. Modern line technologies have provided us with lines that have excellent slickness, and floatability which make picking the line up, mending and overall line control easier than ever before. But surface accumulations of dirt, silt, algae, or other foreign materials affect the line performance and can even make a floating line sink. Therefore, thorough cleaning of the line is essential to continued performance and can be accomplished in a number of ways. Commercial line cleaners are available and can be used in the field or at home, but during my routine cleaning I prefer to use a wet rag and dish soap. Strip the line off the reel allowing it to coil onto the floor, then place the backing end of the fly line onto the soapy rag and firmly clench it in one hand. Pull the line from the backing end through the rag applying pressure as you pull, while occasionally changing the position of the line on the rag to provide a fresh cleaning area until the entire length of line has been cleaned. I'll usually continue by repeating the step, pulling back from the leader end until the line path on the rag is clean, then pull the line through a fresh rag with clean water to remove any soapy residue. After cleaning, the line should be treated with a commercial line dressing to protect it, and prevent accumulation of contaminants. During the cleaning process, the line should be examined for cracking, nicks and abrasions. If damage is noted near the leader end, a short section can be cut and removed without noticeably affecting the casting performance of the line. If general overall wear or cracking is noted, the line should generally be replaced, although a double taper can then be reversed. Another common malady of line that's been stored on a reel for extended periods of time is "memory." Some lines are more susceptible than others, but all lines are affected to some degree. Memory can be, at least temporarily, reduced by stretching the line. Have one person take the leader end of the line and walk away with it, pulling at least a casting length of line away while the other person holds the reel. When the desired length of line is off the reel, both people should hold the line firmly in their hands and pull, stretching it for several seconds. Line can also stretched by a single person afield by wrapping the line around an immovable object, but care should be taken to avoid damage of the line. Monofilament comprises the weak link in the chain between the angler and the fish. Examination of leaders and tippets should be performed often, observing for nicks and abrasions, while strongly testing all knots. While preparing for the upcoming season, anglers should be mindful that, as wonderful as monofilament is, it has a finite life. Age and exposure to the environment degrade monofilament, affecting the elasticity and overall durability of the material. It may be on a newer spool, and appear to be strong... but the properties and strength do change with time. This may not be a factor on the larger diameter materials used for upper sections of the leader, but it can be critical if used in the smaller diameters near the fly. Consideration should be given to replace old tippet materials with fresh at the beginning of the season to avoid those frustrating tippet failures and possible loss of that once in a lifetime fish. During our spring equipment work up, we should open those fly boxes and begin to organize and inventory our selections. When we're done, we should have an idea of what we used (or lost) the most of, but more importantly, we should have an idea of what we NEED the most of going into another season. This may not hold absolutely true, but it's a start. If we need to tie and are getting behind I suppose we should take first things first, and tie what we'll be using at the start of the season. Granted we know we hammered our "eggs and flesh" selection last fall, but we probably have some time to get back to tying up those patterns before they are needed. Ice-out Rainbows are very close at hand and we'll probably need to stock up on our Chironomids first. While inventorying and organizing our boxes, we should examine the flies for rusted or bent hooks, shredded bodies and crumpled feathers. Some damage will have invariably occurred and the casualties should be discarded if they can't be repaired. Repair of flies is relatively limited, but a couple of things can be done. If the fly is intact, but smashed or crumpled, it can be rejuvenated with steam. 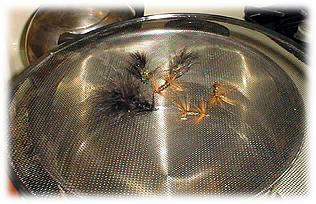 Assemble flies for the steam treatment in a wire strainer, then hold it above a boiling pot of water or kettle. After steaming, the flies should be allowed to dry thoroughly before returning to the box, and will be much improved for looks with this treatment. Just be sure to use an absolutely clean screen which has no oil or grease residues on it. The other (most important) repair that should be made is sharpening. Large, heavy flies used to pursue many fish in Alaska are bounced along the bottom of rocky streams resulting in the fine point of the hook being dulled. The point still looks sharp, but the performance of the fly is affected. Because salmon have hard mouths, and the hooks used to catch them use a larger diameter wire, it can be difficult to get solid hooksets. Extremely sharp hooks will improve the rate of hookup and result in more fish landed. To test the sharpness of a hook...draw the point across a fingernail. If it cuts easily into the fingernail leaving an obvious scratch, it's probably fairly sharp. If the hook point slides across the nail with minimal evidence, it needs to be sharpened. Take the opportunity early in the season to sharpen last years flies, then sharpen often while onstream, particularly if fish are being hooked but frequently shake the fly. After a day afield it's always a good practice to open the flyboxes after returning home to allow the wet flies to dry to avoid rusted hooks. Its also your instant reminder of the need to restock patterns you are beginning to run low on. These maintenance practices and others should generally be performed after the season has ended, and before winter storage, but anytime is better than none at all.